Your company likely understands the criticality of getting near misses reported. With a good near miss reporting system, loss reductions of more than 90% have been achieved. However, not all near misses need full investigation. PII can help your company identify a system for determining which cases to fully investigate and save your company precious time and resources. One way to determine which cases to investigate is to let front line foremen or supervisors decide based on the apparent Learning Value of the incident. The foremen or supervisors can easily decide based on their hands-on experience. For high learning value incidents, investigate now. Low learning value incidents can be put in a database and investigated at a later date, if necessary. Data collection – collecting, organizing, and preserving all relevant data as quickly as possible after the incident has been stabilized. Data comes in the form of personnel interviews, physical evidence, and documentation. Root cause analysis – For each identified causal factor, use a combination of the “5 Whys” and a Root Cause ChartTM (derived from the management oversight and risk tree process developed for US DOE’s Savannah River Laboratory) and step down to find the root cause(s). Customization to Client’s Needs PII finds the best approaches to Incident Investigation and Root Cause Analysis to fit your specific needs and company culture. We deliver the highest value of service by customizing what we do to each client’s need. Industrial experience of our providers Each of PII’s experts has many years of implementation experience as they worked in the chemical and related industries before becoming consultants and external trainers. Many other consulting companies will sell you services and training from “experts” who have only ever been consultants. This is of little value to you compared to using consultants and trainers who have learned what works and doesn’t work by actual experience in settings similar to yours. PII Conducts Meetings with Speed & Efficiency. Because of our vast experience spanning 25+ years of performing IIs/RCAs, and with our hands-on expertise in the best software, we can lead meetings faster than anyone else, while maintaining quality/thoroughness. This saves cost for you and your projects. PII staff have trained over 3000 investigators during the past 17 years of teaching this topic. PII staff have led over 100 major investigations of chemical and industrial accidents. 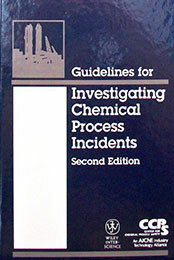 William Bridges, President of PII, co-authored the definitive textbook on this topic by AIChE, Guidelines for Investigation of Incidents in the Chemical Industry, 2nd edition, 2003.